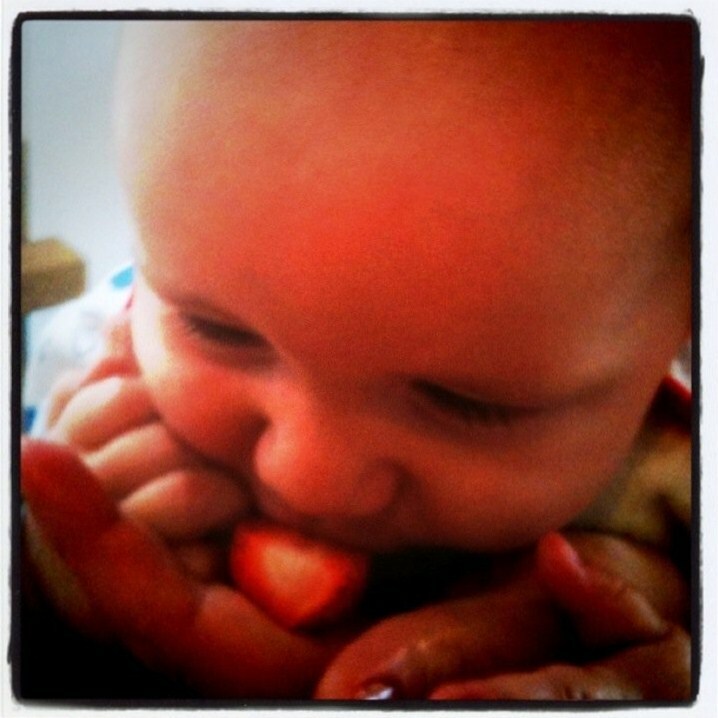 Newborn goes gaga for his first taste of fruit as we celebrate Mr Thatwoman’s 34th birthday with friends, Eton Mess and 34 (count ’em) kisses a piece from Spider-boy. Birthdays bring out the best in Spider-boy. He spends the day asking what it was like when Mr Thatwoman was ‘only 33’ and getting frustrated that his own Birthday is not for two more months. He’s sated, at least, by the chocolate raisins and book of facts about animals, especially predators like sharks, he ‘gave’ his dad. He’s mainly interested in what they eat, of course and crucially whether they eat each other. Eating your own kind is something of a preoccupation, hence his shark love as he’s heard when they get excited they start nipping each other. He’d better watch out though, with his talk of biting. The plan to wait to wean his brother until we returned from our travels (and Newborn was a full 26 weeks, rather than 24) went awry as he launched himself at all our plates this week. Go him, ignoring protocol and seeking his own true baby-led weaning path, thrusting anything vaguely the right size in his mouth by the fistful whenever he could grab it. And look out Italy, here he comes. He’s much improved and rolling, shuffling and sitting and is prepared to just lower his face into a plate of food if no-one gives him anything to hold. And beware, too, of his gnashers. Current tooth count is two (going by how many you can clearly see) and three if you take into account how it feels when he bites you.